My father always tells me to pick up my head when I walk. I guess I have developed a bad habit of having my eyes stuck to the ground. Every morning when I drag my corpse to school, I rely on the cracks in the sidewalk rather than the houses I pass to guide my commute. I am not sad. I just can’t find a spark ignite my days. I guess that’s called boredom. I know it’s supposed to be against the nature of a teenager to feel this way, but I sort of enjoy school, or at least don’t mind it. It gives me something to do. And at this point, any direction at all is comforting. If I was not held accountable to raise my hand and announce ‘here’ each morning in homeroom, I don’t know why I should wake up. I am sure someone would eventually drag me out of bed. I have friends, but more out of convenience than any legitimate connection that I feel we share. People have a tendency to look down on those without friends. So I have some that I just don’t really like. My experience has been atypical. No parties. No extracurricular activities. I’ll probably regret it when I flip through my yearbook in twenty years and can’t find any memories. But I am in the background, quietly observing as the masses participate in their ecosystem. I am careful not to disturb them. I hate the summer. At no other point do I become more cognizant of my lack of priorities. When the sun raises enough into the sky to peer through my window shades, I roll over. My day is empty. It is only the first week of June, and I am bored of being bored. I wander through the halls of the house aimlessly. I test one couch after another. I am the mouse spinning on a wheel, trying to make progress but lacking the option. With any purpose lacking, my body is becoming restless. 20 pushups here. 20 pushups over there. I need a goal. I am lying on the floor with my body angled towards the TV, but the screen is black. My stomach is growling. It’s 2pm and breakfast has avoided me. I don’t care enough to do anything about it. I hear the front door open and car keys jingle against the change in the same crowded pocket. My dad. -Your report card came in the mail. Want me to open it or should you? -Do you want to at least see how you did? -I know how I did. You’re welcome. Perhaps this is where all of my problems stem from. My blessing is my curse, and the absence of any motivation its side effect. I watch my father’s eyes as he opens the envelope. He doesn’t even flinch anymore. It escapes all forms of logic to him. He has never seen me open a book, or do much of anything besides slouch in my chair because my spine is too lazy to hold me up. I don’t think I am any sort of savant, or genius. I haven’t discovered anything remarkable in biochemistry, or written any groundbreaking papers, but I can ace most high school tests. There is a secret to it. It’s really simple, but most students don’t care enough to put it into practice. All you have to do is pay attention during class. And if you can regurgitate that in the form of multiple choice, and simple sentences, you’ll amaze a teacher without ever crafting a single original idea. I have nothing else to do, so I listen. -What do you mean? I’m sitting here. -Do you have anything coming up? -I have school, in September. -And there is nothing from now until then? I was thrown off by this inquiry. You’re my father; you know that I live this slothful existence. When you walk in from work each day, I am always here, doing this. At what point in your parenting strategy were you going to recognize this as a problem and try and fix it? I guess now, about sixteen years too late. -Pack a bag. We are leaving in the morning. -You and I—We are leaving. -You can’t do that to mom. -Very funny. We are going camping, just us. I know you don’t see it very often, but there is a world that exists outside the bounds of these walls. There are mountains, fields, fresh air and a sky that you’ve probably never seen. Sixteen is a weird time for a father and son. When I was younger, he was my hero—the strongest man in the world. But in your early teen years you begin to grow apart, and it becomes pretty noticeable that all attempts to reconnect on any level has become a forced interaction. The last year or so, my stance has started to change a bit. I know he is amazing, but in a much different way than my superman. And he is still forcing our relationship at unheralded levels. I probably should have set an alarm. But that would have meant that I would have gone to bed absent of all hope. A part of me thought I’d wake up at noon and realize it was all a dream. That, and I am not entirely sure I remember how to use my alarm. My door busted open at 7:30 and the switch was flipped on. The light blasted through the bulb and pierced through my once closed eyelids. Before I was responsive enough to resist I found myself in the car and we were driving into the mountains. The car ride was mostly awkward. I sat looking out the window, contemplating how I found myself in this position of being punished for literally doing nothing. If it weren’t for the low volume of the radio providing some background noise, we would have had to confront the silence. Instead, I was able to hide with my face pressed against the glass admiring the scenery. After only a couple of hours cruising at the speed limit, mountains surrounded us. I reluctantly grabbed my bag from the car and followed behind. -Yea sure, just tell me what I have to do. -Grab the tent from the trunk, open the instructions and piece it all together. It may take fifteen minutes or so. I am going to gather some firewood. -Why didn’t you just bring some? -Because this is part of camping. We could have slept in our house tonight as well, in a very comfortable bed as always, but we are choosing to sleep in a tent. That ended that conversation. He walked away shaking his head, and headed a bit into the woods to gather some sticks. I meanwhile was faced with the much more complex task of assembly. The pictures were large and well diagramed. Despite my lack of experience, my fully functioning brain was capable of completing the job, and much to my father’s pride. As he was setting up logs in a crosshatched pattern, I found myself slowly accepting this unfamiliar setting. I tried to resist, but I felt oddly satisfied by setting up the tent properly and that kind of twisted my mood around a bit. Maybe my father was onto something. Before long, we were starving. The comfort of having a fully stocked pantry just a few paces away is a modern day luxury. I have never even seen my mom put food in it, but it seems that no matter how much I take out, there is always more going in. We got the fire going with the matches we brought, and by we, I mean my dad. I found some long thin sticks, and washed them off in the lake. We pierced the hot dogs with the twigs and held them over the fire. I have never made dinner before, outside of throwing a pre-packaged meal in the microwave, but with the beans heating up as well, I am willing to call this my first. -Think about it. ‘I don’t know’ isn’t an acceptable answer. If you could eat one final meal, what would it be? -I don’t know. At Joey’s bar mitzvah they had this lobster macaroni and cheese that was really good. -Have you had it since? That was like five years ago. We were talking. My dad works a lot, like most dads. He is a writer. Not a journalist or anything like that, but an author. He doesn’t work from home because he claims he can’t work with so many distractions. Most of what I know about his career I have heard from eavesdropping on conversations with my mother. I only went to his office once when I was younger, and it’s hardly big enough to fit a desk into it. He has a small bathroom attached to it, and the room is wholly undecorated minus one painting and a bookshelf. That same painting is in his bedroom, and a slightly different version in the basement. There is a window that takes up almost an entire wall, and the view is impressive. It stands overlooking the river, with the skyline in plain view. I don’t see how that’s not a distraction. There wasn’t a soul in sight. Leaving for the hike, I was a bit worried about our things just being left behind. As if we would come back to find Goldilocks spread across the sleeping bags inside our tent. The trail was fairly thin and winding. At a couple points we were even descending, a discouraging point for progress. Hiking seems like it wouldn’t be that hard. It is just walking, but by the top I could feel the pulse in my forearms pounding. The peak was rocky, and the view actually gave some perspective as to how far from civilization we were. It was just he and I out there. Alone, together. We took a break at the top to appreciate the work we had done, but turned around soon after as the sun was beginning to set. -Did you just suggest we do something? -Yeah, I like candy sandwiches. -Grab the ingredients out of my bag and the sticks, as well. We sat beside the fire on a makeshift bench from a fallen tree. The sun had gone down and the stars were out. Thousands more than I had ever seen. We were sitting next to each other, starring into the fire as we spoke. No eye contact was made, all attention focused on keeping the marshmallows evenly roasted. It was comfortable. -Have you thought about college? -That’s good to hear. But have you really thought about it? Where do you want to go? What type of school you want to be at or what part of the country? Do you want a big party school, do you even do that? Is there a certain major that you’ll want? -I guess I haven’t thought of it THAT much. -What do you want to be? Not that you need to know yet, but have you bounced some ideas around in your head? You’re such a smart kid, too brilliant for your own good most days. I just want you to find something that’ll excite you. -I don’t have to know yet, do I? Can’t I just go somewhere and then figure it out? -DAD! Can we change the subject? -Yeah, sure. I didn’t know what I wanted to do when I was your age. I was more interested in chasing girls and getting away from my parents. -Well when did you figure it out? -Not until after I graduated. I took a year to travel around a bit, and sort of discover some things. Did I ever tell you about that trip? -This is the first time I’ve ever heard you mention it. -Seriously? Man, what a great year that was. I graduated in 1983. My parents threw me this big party in the backyard to celebrate. Your grandfather knew how to put on quite the BBQ. Everyone came around, and there were so many gifts, mostly cash. Everyone kept asking, ‘What are you going to do next year?’ and ‘What job have you got lined up?’ I got sort of tired out by it. I went to college to be an engineer, but I left with a degree in English. A liberal arts degree doesn’t exactly point you in a specific direction when you finally get kicked out of the dorms. So halfway through the party, I give up and decide I am going to stop trying to appease all of my father’s friends with a bunch of lies. I start telling people I am taking a year off to travel and write. -Where’d you go? Who all went? -The next day, I take all the money that I got as gifts and I headed down to the used car dealership and bought myself my first car, a 1974 station wagon. It was the ugliest brick red you’ve ever seen with all the paint beginning to chip off. My parents gave me an ultimatum and told me to get a job and get out of their house, or I would have to start paying rent. So I got in the car with my lifetimes savings in a duffel bag in the passenger seat and I just drove. -What?!? Really? That’s so cool. What a rebel move. So where did you go? -I went everywhere. I went up and down both coasts, stopping and staying with friends and working odd jobs for a week or two here and there. I’d pick people up and drop them off. When there was nowhere to sleep, I pulled over on the side of the highway and slept. I had no plans, no directions, and no set day to return back to a normal life. -They thought it was cool. I’d meet people and tell them I was a writer. -What did you write while you were on the road? -What do you mean nothing? -Well that’s a lie, I wrote one poem and a couple letters home. Aside from that, I didn’t write a damn thing. But people were intrigued. I told them I was researching. -Yeah, I needed material. My life up to that point had been predictable and easy. I had nothing to write about it. So I met people, and learned from them. I heard their stories, and in turn developed my own. Every page a writer writes is a reflection of his own life. It may not be autobiographical, but the inspiration comes from somewhere, if not your own imagination. Then you develop it into something bigger. -It’s like that game we would play when I was younger. Sitting outside the coffee shop and making up stories when people walk by. By the time they had walked the block, we had an entire life for them. This conversation was not what I expected. I prepared for a lecture. I had never seen my dad this way. It is easy to forget that your parents are people. Similar to the realization that teachers don’t live at school and have families and lives beyond giving out homework. It seems that before I came along, my parents did things. -What did mom study in college? -Art. She got me into it. -You know that painting we have in our house? The blurry colorful one. What is that? -That is a painting of the houses of parliament. It’s done by this guy, Claude Monet. It is by far my favorite painting. -Why do you like it so much? -It’s not just one painting. It is a series. 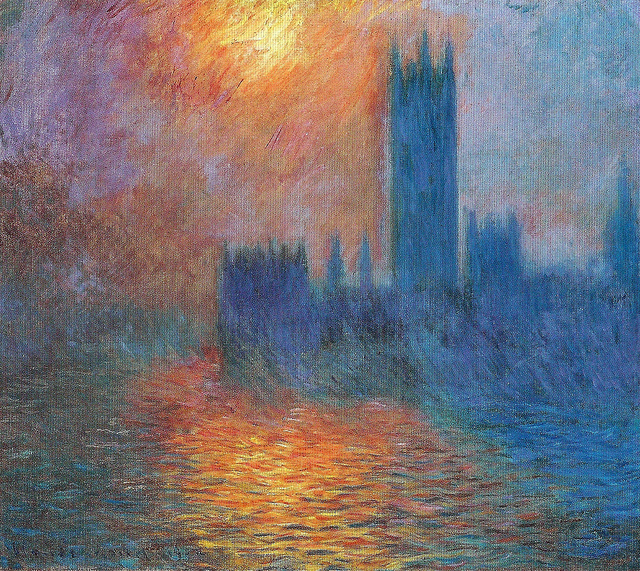 For years, Monet would go and visit London. Every time he went he would stay in the same room, overlooking the Thames River with a gorgeous view of the British Parliament. He painted it over and over again. Looking out the same window, but in so many different ways. -It seems a bit repetitive. Why wouldn’t he go somewhere else to paint something new? -I don’t know. But I like it. I see it as a metaphor. You can look out the same window and see the world in so many different ways. It all depends on the perspective that you want to take. Do you like art? -…I don’t really get it. -What is there to get? -What makes something beautiful? I don’t really see the point. -Art doesn’t have to be something beautiful. It just has to make you feel something you didn’t feel previously. You know, writing is considered an art. I bet you’ve never really considered me an artist. Have you ever even read anything I have written? -Nothing more than a birthday card. -Really? I can’t believe that. -I don’t see the appeal. No offense. Why do you like writing so much? -What do I like about writing? What a loaded question. How about the fact that I will hopefully have enough money to pay for your college tuition? That’s pretty good. But there is one thing that I think makes writing so special. When you create something, any form of art, it is the preservation of an idea that you created in your mind. Unfortunately, we don’t have a lot of time here. And for most of our sad lives we are ignorant and exploring the world around us. It isn’t until the much later years that we begin to grasp the world by which we are surrounded. We spend decades building relationships, reading books, watching the sun rise, and making sense of it all. It’s all these experiences that allow us to learn. And everyday we discover more, until the final day of our existence, when our brain is as crammed with as much information as it ever will be. And then we pass. And with us goes our ideas. Unless of course you wrote some of them down along the way. -And that’s what you’re doing. -Exactly. I write with the hope that someone reads something I said, and it has an impact on them to look out the window and see a whole new perspective of colors. My wish is that there is some possibility that an individual stumbles upon something that I said, and won’t have to wait as long as I did to reach the same conclusion it took me twice the time to grasp. My words gave them a shortcut. And when generations pass their concepts forward, we will continue to advance and maybe I will be a partially responsible for that. My writing is my contribution. Charles wakes up at 6am, he does this everyday. His life is a routine. The alarm isn’t set for any particular reason, except to have a reason to get out of bed. It’s depressing to sleep in and to wake up only to realize there is nothing on the day’s agenda. Charles may be old, but he still has his mind, and he knows this little trick gives the allusion of purpose, rather than actually providing one. Being tired is good. People who do things, important things, feel tired. So Charles wakes up sleepy, gets out of the house, and starts the day. This is how things were before his regretful retirement, and they’ll most likely stay this way until he no longer can. The railing that runs parallel to the stairs is Charles best friend. It’s there for him when he needs it, but it doesn’t need to be carried around to remind him of his weakness. That means no cane. His steps are slow, but he’s racing the sun. As it crests over the horizon in front of him, he steps into the same restaurant once again, with the cathedral casting a shadow over Broadway. He doesn’t order food; it’s already being prepared. Adolfo is wearing the same Yankee cap that he’s been wearing since 2001, and just like his wardrobe, his morning customers stay the same. The whole-wheat toast pops out, and he pours the coffee, and passes the cream cheese and strawberry jam. The stomach prefers monotony. Charles gives Adolfo a nod, and opens up his newspaper to read what happened while he was asleep. There is no chatting to the same man that serves him everyday, or the widow who sits at the booth behind him. He goes about his business, and has his second cup of coffee, just as black as the first. Charles watches as the tourists come in, and he blames them for the higher menu prices. It wasn’t like this in the 1980’s, before this restaurant turned into a destination. Charles pays $5 even, with the tip included, a small admission fee for the comfort of keeping things the same. He heads past the stream of students winding in and out of the sidewalk’s traffic to make it to class. He remembers the days he could move side to side with swift direction changes. Now he breaks up his commute into 25 steps at a time, resting for a moment to catch his breath at each checkpoint. Charles sits down on a bench in the middle of a split in the road, and he’s surrounded by a garden that is still holding onto the previous spring’s blossoms. In his back pocket is a book, just sleek enough to fit, like an oversized wallet. Before he opens it to read he takes an instant to relax. This day is satisfying for Charles. Most are. He’s walked the distance of a few blocks before 9am, and he’s exhausted, but happy. He opens up his book midway through, to where a crisp dollar bill is holding the place of where he left off. It’s a thin book, but his eyes can’t scan like they once did. On the other side of the street corner’s garden, he sees a young man carrying a big fancy camera. He looks young and intently bohemian. The young man walks up to a man playing a guitar and drops a couple dollars into his hat. But he stands around and waits for the song to finish. He sits down on the bench beside the guitar player, and a conversation begins, but Charles loses interest and gets back to his book. His head turns slowly as they follow the words on the page. He’s consumed. Charles hears an excusatory cough, and takes eyes off the paper to see a pair of beat up, navy blue converse shoes standing in front of him. It’s the young man. -Excuse me sir, would you mind if I sat with you for a moment? Charles just stares at him blankly. He’s ruffled by the forwardness of this gentleman to interrupt an old man sitting on a bench in peace. He looks at him, and tries to read his intent. There are countless benches surrounding his own, and he sees no need to sit on top of each other, except this man is obviously looking for a conversation. Charles does not say yes, but slides over half an inch to the left, which is invitation enough. -My name is Wellington. I am a local student studying photography, and was wondering if you’d be willing to chat with me and assist me in a project I am working on. You may call me Well–it’s a nickname. Charles has been awake for hours, but he hasn’t made a single sound with his mouth yet. There just hasn’t been anyone to talk to, and there’s been no reason. It’s not a choice, but lack of opportunity. Now sitting close enough to his right hip to feel the warmth of this student is Well, a stupid name. He seems interested, and Charles is uncomfortable with this. No one is supposed to be interested in anyone else in New York. -Sure you may. I don’t see how I could be of help, however. -As I said, I am a photography student and I am working on a project. The project is about the people of New York. I’d like to take your picture. -If that’s all you want, I suppose so. -But I’d also like to hear about you, and just get an idea of who it is you are. It’ll help me portray you better, and how to represent you. A picture can tell an incredible story, but with just a few details, an audience can connect and get to know the subject. -My name is Charles. I am 83. I live in New York. Is that it? -Ha, that’s a start. What do you do? -Nothing, I am retired. That’s why I am sitting on this bench on a Tuesday morning and not in an office. -What did you previously do? -I was a butcher. I owned a shop up in Yonkers with my brother. That was twenty years ago. -What happened to the shop? -It’s gone. What does this have to do with me in one of your pictures? Was the guitar player not good enough for you, son? Charles wiggled his body away from his inquisitive interviewer. This was the worst question he could have asked. Seemingly innocent, but it’s not the type of story Charles shares. It still stings. If his brother were still alive, he’d punish him for some of the stunts he pulled. He was supposed to handle the numbers, and leave the butchering to Charles. Their hands told the different stories. Charles had thick sausage-like fingers. They carried things and they cut things. Not his brother. He was not the physical type, unless you count talking as physical. He was overtly unctuous, and could excuse his way out of a ticket. But he tried to be too sly, and his false accounting was eventually found out. He died the week before the IRS came knocking. Charles went from crying while expressing his love for his brother during an emotional eulogy before a small crowd of distant friends, to hating him for all the same reasons that he was so loved. He found shortcuts, and he took the easy way out, but he was so likably open about his flaws. It was attractive in a sense. He could fill a room with laughter instead, and a day was better with his quips. But keeping the tax forms honest was apparently too much work. Twenty years later, and Charles is still struggling to forgive that mistake, but he can accept it. -I’m sorry, how about that book? What are you reading? -‘The Stranger,’ it’s by Albert Camus. I have read it a lot. -Why do you read the same book so many times? -I like this one. I will read others, but I always come back to this. Meursault, that’s the name of the main character, no matter how many times I read it, I can’t figure him out. -Isn’t that the same guy who wrote about the guy who carries that rock up the mountain every day? -Yes, Sisyphus. When he gets the rock to the top, it rolls back down. His life is filled with this, everyday the same, but he is happy. I am sure this will help you make a great photograph. -Forget the project, that’s not important. I am curious to hear more about you. -I’m glad an old man on a bench with a book can be so entertaining to you, but I have to go. I am going to be late to meet a friend. As Charles was gathering himself, and motioning to stand up, Wellington jumped up. At this surprise, Charles sat back down. The picture. Wellington asked him to show his book, and to look away. He would take five pictures, fiddle with his camera, and change his angle. It seemed rushed. He did not want to take up anymore of this man’s time, so he worked quickly. Charles didn’t know what to do. It was awkward. Before walking away, Wellington offered to send Charles the picture when it was finished. -I have plenty of pictures from when I had more hair. Charles put his book on his pocket, and began the next part of his day. He’d be late, by only a minute, but a minute wasn’t too long for Fred to worry. Fred is a veteran. His wife passed away a few years ago, and now the difference between a good and bad day is if he can win this chess match. Their record is mostly even. They never keep score, but it seems that way. Charles never had a wife. He was close. It’d be nice to have someone to sit with in the evening, but he’s content in his independence. Charles has friends who can spend hours on the couch in complete silence with their wives. He does not know what that is like, but it sounds dull. -Why didn’t you ever get married? -It didn’t work out. You only have so many chances with these things, and mine didn’t work out. Charles has this tendency of ending conversation abruptly. An answer that is vague enough to avoid the question. Fred and Charles met late in life. They are not the childhood friends who know each other’s history. They only met a couple of years ago. Charles had never known Fred’s wife. But now they’re so intertwined in the monotony of it all, they couldn’t remember what it was like previously. Before they sat down to start their game, they purchased a hot dog from the cart on the north side of the street. Always with sauerkraut. Fred introduced Charles to a world beyond ketchup and mustard. The match is never timed, it’s quietly competitive, but slamming a clock at the end of each turn would stir too many emotions. Fred wins today. They sit looking out on the Hudson for some time. When bikers or runners pass by, they’ll maybe turn to each other and comment. Nothing exciting happens, which is normal. A handshake and a farewell; and Charles heads in the direction of the grocery store. The rest of the day is fairly typical. He heads to the frozen section in the pack, and finds a half price meat. It is about to go bad, if it has not already. He has money. But he is still frugal. That is after all, why he has money. He heads to the canned aisle, and gets a vegetable. This makes it simple when he is home. He puts meat and the canned vegetable on the stove at a low simmer. He has the time. After dinner, he sits in the chair next to the TV. There is a fat cushion on the wooden rocker, making the uncomfortable chair slightly tolerable. He opens his book to read, as Jeopardy and Wheel of Fortune creates background noise. He’ll look up to watch for a few minutes if there is a category he favors. But he doesn’t really care for “Islands of the Caribbean” or “The Art of Shaving.” Just as the sun is barely ducking beneath the sky, he changes into a pair of loose flannel pants and takes his socks and collared shirt off. He collapses into bed, and when his head rests on the pillow, he is asleep. Tomorrow will be much like today, and it will be draining. At 6:29 AM, Adolfo drops the bread into the toaster. He turns towards the door when the bell rings over head and there is a woman. She approaches him, and asks to sit at the counter. She is middle aged, with hair that is fighting to remain dark. Her name is Megan. She orders a cup of tea, with milk. At 6:30, she is sitting alone, with her body faced towards the door. She is waiting for Charles, who she was told would be here at this time. Charles doesn’t normally have many visitors, but when he does, they know where to find him. He has lived his whole life like a clock, and you can predict what’s next. But not today. Today will not be like yesterday for Charles. His body peacefully rests in the bed of his third floor apartment. Today was not a tragedy for Charles, he accepted this day long ago. As he passed, he was not aware, and how and when did not matter. At least not to Charles. At 6:32, Adolfo keeps checking the door. This is the latest Charles had ever been. Megan orders a couple of eggs cooked sunny side up, and an order of toast to soak up the yolk. Adolfo doesn’t know Charles, at least not as a friend. But he is a part of his life; he is a constant. When his world is chaos, Charles remains simply, there. -Excuse me, I am looking for an old bald man, his name is Charles. I was told I would be able to meet him here at this time. Am I mistaken? -Miss, Charles comes in every day. He always sits at the spot next to where you wait. But he is not here today. I am sorry. The toaster popped a long time ago, and the warmed bread is now cooling. Adolfo removes the toast and places it upon a plate. He hesitantly puts it in front of Megan, as she waits for her eggs. She pays her bill and before she goes she checks with Adolfo one more time. -So you are absolutely certain a man name Charles comes in here every morning? -Yes, he was in yesterday, and the day before and the day before. I don’t know where he is. If I see him, I can tell him you were looking for him. What is your name? -My name is Megan. Could you have him call me on this number please? -Of course. Should I tell him anything else? What’s your relation? -I didn’t know he had a daughter. Megan walks past the register with her heels dragging behind her. It took her a long time to collect the courage to come and try and meet her father, and the day she finally does, he is not the one place she was told he would certainly be. Her heart is still beating, and she feels deflated. She had pictured today going differently. And now she imagines her father getting a note with a number saying that his daughter had come in looking for him. He’ll be so confused, this wasn’t how it was supposed to be. Before the door shuts behind her, she pokes her head back in and yells to Adolfo. -Actually, forget it. I just moved nearby. I’ll come in again–tomorrow.